Sometimes the weather gods just smile upon us. This past week, at least where I garden, has been glorious. Warm and sunny and well above normal. That is wonderful because I was way behind on my fall cleanup chores. “Dallying” is a little late for the same reason. 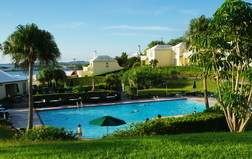 The Assistant Gardener and myself decided to check out how to make good hedges from Hibiscus, in case some of my readers need that information, and spent a relaxing week in Bermuda doing just that. We also surveyed the Palm tree population and even checked out the marine vegetation. Yes, the ocean was warm enough for a little salt water frolicking. After returning to a week of cutting, chopping, composting and cleaning this gardener’s body is starting to long for another week in a deck chair. Composting really is amazing. By Tuesday the bins were both filled to overflowing and by Thursday morning they had already reduced enough to take that day’s offerings. Do I compost everything? No. You have met my large walnut tree before and it provides much material that goes out to the town’s composting program. It drops thousands of little leaflets that still retain some Juglone, the toxic chemical produced by Walnut trees that limits growth around them. I put them all on one section of the vegetable garden a couple of years ago, as an experiment, and the Tomatoes and Peppers that were planted there grew very poorly. After the leaves are down this tree then drops its petioles. That is the wiry stick that holds all of the leaflets on its compound leaves. They stick in everything, they are hard to rake and they take years to compost so I let the town do that for me. Roses and Raspberries also go into the brown, curb side, bags so that I don’t get a finger full of thorns next year when I’m digging in the compost. We are blessed to have a very good municipal composting program and that allows me to be a bit of a lazy composter and retain a clear conscience. I am conflicted. There is still much to do and enjoy in this year’s garden. We are still eating a variety of fresh vegetables and I haven’t finished planting the bulbs. The first of next years seed catlogues arrived in the mail this week. I’m forced to just glance at them as I put them out of sight until the snow is deepening and I desperately need a peek at what is to come next spring. 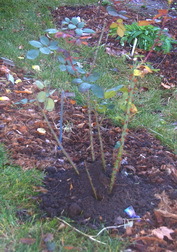 Am I really putting Rose prunings in the compost in the fall. Yes. I prune the long tops from the Roses, except the couple that were still in bloom, leaving about 50 cm of cane. In my part of the world Roses are a bit difficult and need some winter care. I will throw a shovelful or two of soil around their base to protect the lower part of the canes from the severe cold. The long tops have been pruned down so that they don’t whip around in the wind and disturb the warming soil that is packed around their feet. The real secret to Rose success, actually two secrets, is to plant them deep enough so that the bud union is well below ground and to plant the new hardy varieties that are being bred in cold places like Morden Manitoba. 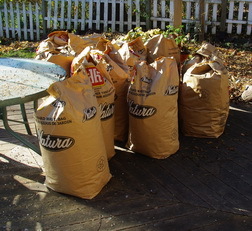 I have many fewer bags at the curb than some of my gardening restricted neighbours. All of the other leaves are simply piled onto the many gardens and by spring the composting and the earthworms have used them to make that soil much richer. I do have a quandary here. In the perennial beds where I have a thick layer of mulch that I hope will last more than one season, what happens when I put leaves on top of the mulch? I will try a small section this year as an experiment and report back to you in the spring. The delightful warm weather this week has also made one autumn chore much more comfortable. 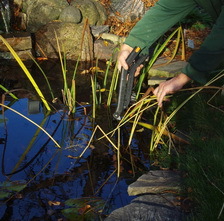 Getting the ponds ready for winter is usually a bone chilling procedure as the ice forms on my arms when I’m removing as much vegetation as possible. Although I keep a towel handy during this process, the need to quickly grab it was greatly diminished this year. Oh yes! For those of you who may have been wondering, Rosie Isabelle, grandchild # 8, did arrive while we were in Bermuda and will be getting her first hoe and Amaryllis bulb this Christmas. Never too early to start them gardening. #9 is now due within the next week or two and we wait expectantly. Shirley Asks? Hi, Ken, My question is about the old King Alfred daffodils. Over the years, I've found them to be the only ones that truly naturalize - (regardless of catalogue claims). Multiplying year by year, never needing to be thinned out, shorter stems that don't bend and break in the wind - all in all, a great bulb for the spring garden. I understand that the true King Alfred is no longer available; new hybrids having longer, (weaker) stems and bigger flowers, which cannot withstand the wind - even a breeze! Do you suppose there are any true King Alfred daffs available ANYwhere? If so, I would surely like the info. I have found many packages of daff bulbs claiming to be 'King Alfred type', but they are not the true King Alfred. .
Ken Answers! It is true that “King Alfred” daffodils are almost impossible to find. Our desire for bigger and better often gets us bigger but not always better in many ways. I have some wonderful sturdy Narcissus that have naturalized well for me but they are not the regular all yellow daffodils. 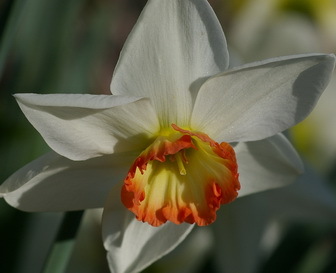 A lovely white with an orange cup, “Flower Record” has performed very well. The all yellow Dutch Master is the best “King Alfred type” that I know of. Claire Aks? Is it too late to pot up some bulbs for winter forcing? Ken Answers! No, it is the perfect time to start potting up some bulbs. Not only is it the right time of year to do so but most of the garden centres will have their bulbs on sale now making it an even better opportunity.